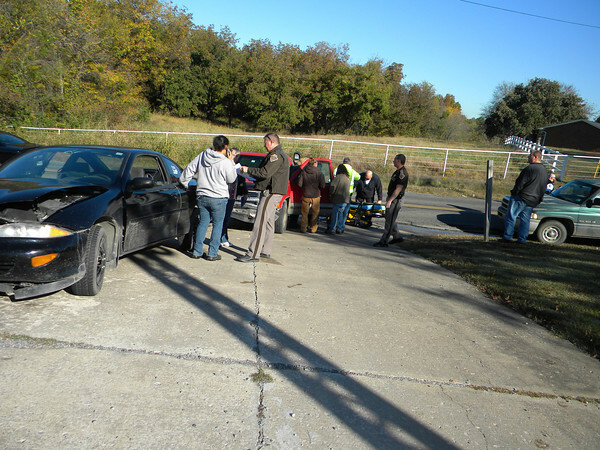 Personnel with the Muskogee County Emergency Medical Service prepare a gurney for a person involved in a two-car accident Nov. 7 on Harris Road. The accident occurred shortly after 9 a.m. on Harris Road between U.S. 69 and 11th Street. Oklahoma Highway Patrol trooper Todd Riggs said a red pickup was pulling out of a driveway on Harris Road. Riggs said that when the driver backed out, it blocked two lanes. He said the black car swerved to the left and struck the truck. No names were available. He said there were minor injuries.